Yesterday was Father's Day here in New Zealand. I was a bit stumped on what to do for Dad's card. Then I decided sunflowers could be masculine. 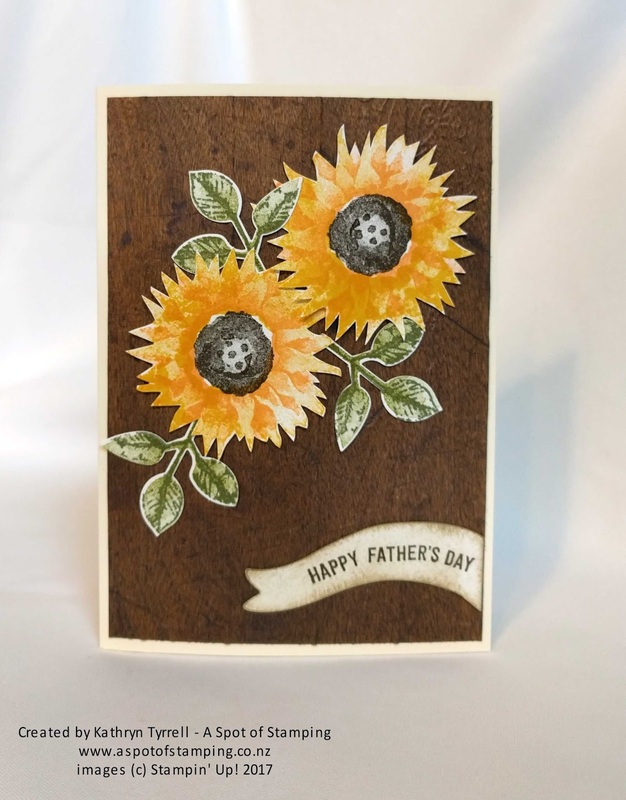 It's a shame you can't see it in the photo, because it really added to the effect, but the Wood Textures Designer Series Paper behind the sunflowers is embossed with the Pinewood Planks Embossing folder. The sunflowers come from the brand new stamp set called Painted Harvest and I love it. The sunflowers are so real. It's a two step stamp and I have used Crushed Curry for the first layer and Peekaboo Peach for my second layer. The leaves are two-step as well and are Old Olive and Always Artichoke. The sunflowers do need to be fussy cut. I know some people hate that - you either love it or you hate it - but the leaves are a brand new punch and I love that too. You can buy the stamp set and the punch as a bundle and save 10%. 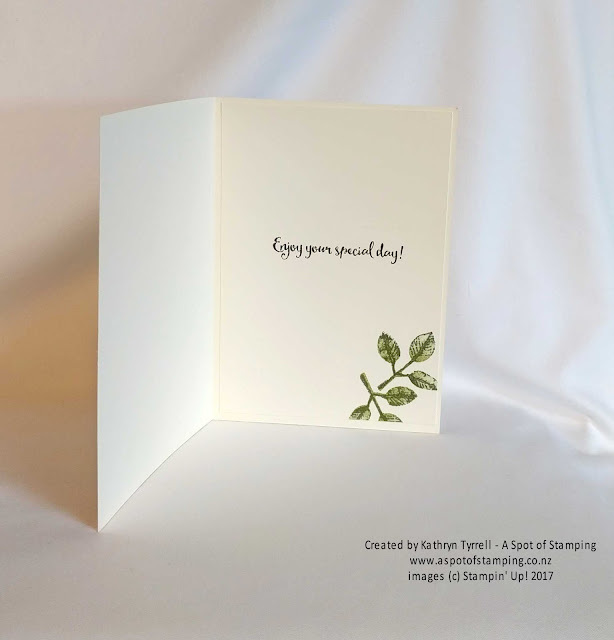 The leaf was just the thing to stamp on the inside of the card too. I used the sentiment from Dragonfly Dreams, which I think is the perfect sentiment for Fathers Day. For the sentiment on the front of the card, I was looking for something long and narrow but I was having trouble finding anything in my stash. Then I happened across the Birthday Friends Framelits Dies. In particular, the flag caught my eye (in the picture of the dies it shows them upside down with the cutting part facing up so the flag is backwards). I cut out the flag, turned it over so it faced the opposite way in which it was intended and trimmed off the flagpole. I sponged the edges with Crumb Cake ink and it became the perfect sentiment - just what I wanted. The moral being - don't be afraid to think outside the box. You might come up with something great that you didn't expect. Thanks to an idea from Pinterest for the inspiration for this card.